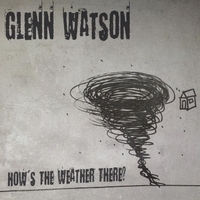 Glenn Watson's debut EP 'How's The Weather There?' is a mix of alternative pop and rock. The record is influenced by artists and bands from America's south, notably R.E.M., Tom Petty and the Heartbreakers, Matthew Sweet, Cat Power, and The Black Crowes. Glenn Watson is an Australian singer / songwriter who writes and performs alternative pop-rock.. He is influenced by such eclectic artists/bands as R.E.M., Tom Petty and the Heartbreakers, Matthew Sweet, The Smiths and The Black Crowes amongst many others. His 2018 debut EP 'How's the Weather There?' was produced by Michael Carpenter at Love Hz Studios in Sydney. Fantastic songs with really catchy lyrics. One of the few EPs where every song is equally as good. Great to hear some authentic Aussie talent is still out there and creating music for the esoteric listener.